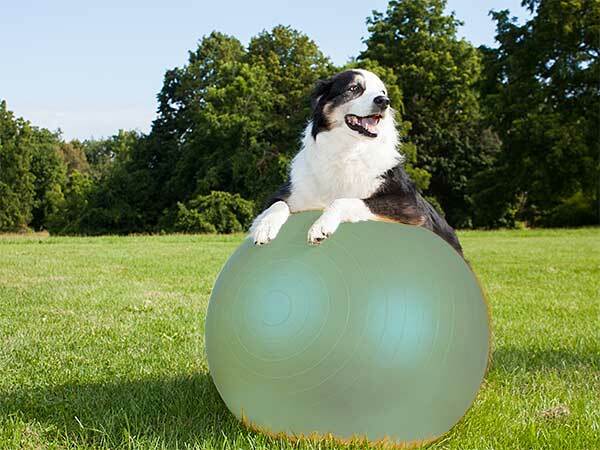 Treibball is one of the newer canine sports but it is quickly catching on, particularly among owners of herding breeds like the Australian Shepherd, for whom this fun new activity was specifically created. It combines all of the skills used for herding with traditional obedience training to give herders a way to show off their abilities and get a work out when there aren't any sheep to be found. Originating in Germany, the sport has built a following around the world, with associations cropping up in various countries, including the American Treibball Association (ATA) and National Association of Treibball Enthusiasts (NATE) in the United States. As this sport continues to catch on, more competitions are being developed and more and more people are getting in on the fun. In treibball, dogs must work with a set of eight large balls, each ball approximately 45-75 cm in diameter, and move them into a confined space the size of a soccer goal. The ball should be shoulder height or higher for the dog. The balls start out in a triangle formation, much like a rack of billiard balls, and the dog must move them one at a time into the goal. The ultimate objective is to get all eight balls into the goal within a 15 minute time period. In order to help the dog complete his task, the handler works with him giving a series of signals either verbally, with the hands or by whistling. The handler is confined to an area that comprises the left half of the goal area and extends back several feet behind the goal. While verbal signals may be given, no verbal or physical corrections may be used throughout the competition. Dog and handler must exhibit a keen ability to work together to accomplish their task. Not surprisingly, because it is so strongly based on herding instincts and commands, this is a sport that is particularly well suited to Australian Shepherds and other herding breeds. For these dogs, herding is an instinct and following commands comes relatively easily so the sport is something of a natural for them. They live to work and to show off their abilities and this gives them the opportunity to do so even when sheep or other livestock are not available. Trideer 45-85cm Exercise Ball great for use in treibball. Great reviews on Amazon. The ball should be shoulder height or higher for the dog. Because it is less physically demanding for both handler and dog, however, it can be suited to many breeds and may be a better fit for those dogs that can't handle the fast pace of agility. It can also be ideal for dogs that have physical limitations but are still eager to please and need to get a workout to remain active and healthy. If you're looking for a perfect activity for your Australian Shepherd and don't have a flock of sheep handy, then this dog sport may be just the answer for you. For more information about finding ways to get involved in the sport in your area, check the ATA or NATE websites or look up a trainer near you. There's no reason why you can't get out there and get moving with your dog, so why not consider the wonderful world of treibball?